This past weekend saw three world title contests take place on Saturday, along with a very controversial interim world title bout. We kick things off in the UK at London's Copperbox Arena, where America's Gervonta Davis, 18-0 (17), lived up to the massive hype campaign that has fueled his young career thus far. The Floyd Mayweather Jr protege was putting his IBF super featherweight belt at risk for the first time since winning it from Jose Pedraza in January, meeting England's top man at the weight, LIam Walsh, 21-1 (14), in a battle of southpaws. After a very cautious start from both boxers, Davis began to get hard jabs through the guard of Walsh, who was having problems coping with the sheer handspeed of the champion. Walsh managed to get in some bodyshots but couldn't find a way to advance upon his shorter opponent, prompting Davis to begin winging his vaunted left hand power shots. The first few of these haymakers missed the target but in the third, Walsh was caught on the temple by a big left and was definitely shaken by it. The Cromer man attempted to clinch but Davis nullified that approach with movement and more lefts. Walsh went down and was somehow allowed to continue despite his very wobbly state but was soon battered on the ropes, prompting a stoppage at 2:11 of the third. The challenger showed durability by taking numerous big punches to the side of the head before falling to the canvas but was no match for the pure speed and raw power of the Baltimore based champion. 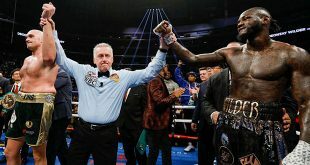 The world's top light welter was in action in New York, with Terence Crawford putting on a stellar performance at the famed Madison Square Garden. Crawford, 31-0 (22), tangled with former Olympic gold medallist Felix Diaz, 19-2 (9), who was expected to give the Omaha based WBC/WBO champion some difficulty once the bell rang. But Crawford put his height and reach advantages to good use, keeping Diaz at the end of punches. The challenger did find some success at times but could never put a cohesive offense together, due to Crawford's ring skills. The later rounds saw the champion dominate the action and it wasn't surprising when Team Diaz elected to keep their boxer in the corner after the tenth frame. Crawford will likely participate in a unification clash in his next appearance, possibly facing IBF/WBA champion Julius Indongo later this year. 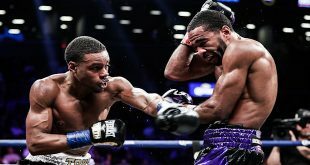 At MGM National Harbor near Washington DC, WBC featherweight king Gary Russell Jr, 28-1 (17), dropped challenger Oscar Escandon, 25-3 (17), in the third round before ending matters in the seventh. The much shorter Escandon tried to pressure the champion but was picked off repeatedly by the far more skilled Russell, who hammered his rival to the canvas with a single punch at 0:59 of the seventh round. On the undercard, Jose Uzcategui, 26-2 (22), was on his way to winning a Interim IBF super middle title bout with Andre Dirrell, 26-2 (16), when the last shot of a three punch combination from Uzcategui landed after the bell to end the eighth round. Dirrell fell to the canvas and stayed there, prompting a disqualification of Bolivia's Uzcategui, giving Dirrell the victory. 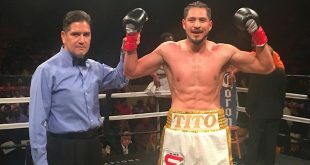 The action wasn't over, however, as a member of Dirrell's training team entered the ring and punched Uzcategui with a left hook, inciting chaos in the ring. It's unknown at this time whether a rematch will be ordered by the IBF, or if Dirrell will get a rematch with full IBF champion James DeGale, who defeated Dirrell for the title two years ago.